It's tempting to just let your little Yorkie Puppy follow along by your side with no leash. Your puppu's inclinations change and as your puppy grows, he won't be as content to follow by your side and will want to wander further. A dog isn't born automatically accustomed to a leash and collar. For some, it's a real shock to find something suddenly hanging off his neck, and an even bigger shock when that thing is pulled up short, stopping him in his tracks. 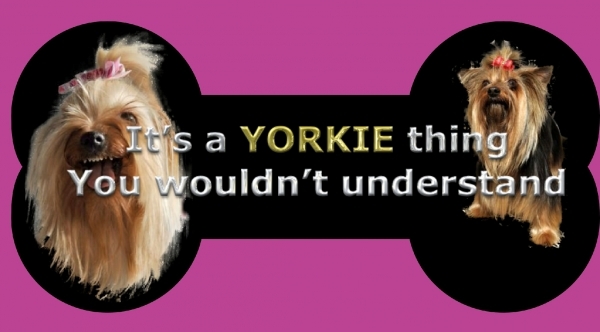 Give your Yorkie a few days to get used the idea first. This first step can begin as soon as your Yorkie puppy - Yorkshire Terrier arrives at his new home. All it involves is getting your young Yorkie puppy familiar with a collar. A simple light weight leather collar is ideal for this task. For smaller puppies you can also use a harness. Place it on your puppy when you feed him or as you are playing, this provides a bit of a distraction from the collar. He'll probably roll around trying to dislodge it, or try his best to scratch it off. When he is doing this it is important that you don't take it off him. Wait till he has settled down and forgotten about it before you take it off. Once your Yorkie puppy has adapted well to wearing his collar, it is time to introduce the leash. Try the same method, you just want to get him comfortable with the leash, and to show him the leash is not to be feared. You can buy your Yorkie - Yorkshire Terrier a fancy leather leash after he is properly leash trained if you choose. All you need to do is clip the leash onto his collar, let him check it out and drag it around the house. Please do not leave the puppy unattended while doing this. The Yorkie Puppy should forget about it after a while. He will realize that it's okay. Now that your Yorkie puppy is comfortable in his collar and with the leash, it is time to pick up the other end of the leash. Make these first leash training sessions short, sharp and fun. At this early stage you will probably find that your puppy loves to follow you around everywhere. To start with just walk around the house with the leash in hand, and your puppy trotting along side you. When he is walking along on a loose leash give him plenty of praise, petting and even some treats. When he strains on the leash, stop immediately. Don't yank him back over to you with the leash, just call him back over to you and praise him when he comes. Never ever keep walking when your puppy is pulling on the leash. Your Yorkie puppy has to learn that when he pulls on the leash, he gets nowhere. If he wants to continue walking, it has to be by your side on a loose leash. The same rule applies if your puppy sits down when you are walking. Don't yank him forward towards you, just call him over and reward him when he arrives. Then set off walking again with your puppy by your side. At all times, be prepared to reward your puppy with little treats, games and other things the puppy likes, for moving with you, coming to you, and looking at you. 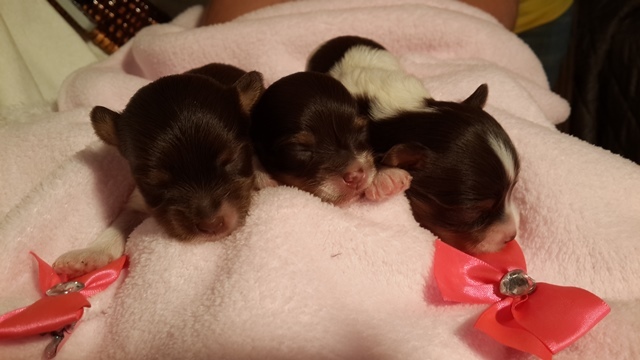 Each Yorkie puppy is different. Puppies have different things they like best, and different things they respond to in different ways. You can build your Yorkie puppy's desires to interact with you by how you use your praise, treats, petting, and the games you and your puppy play together.